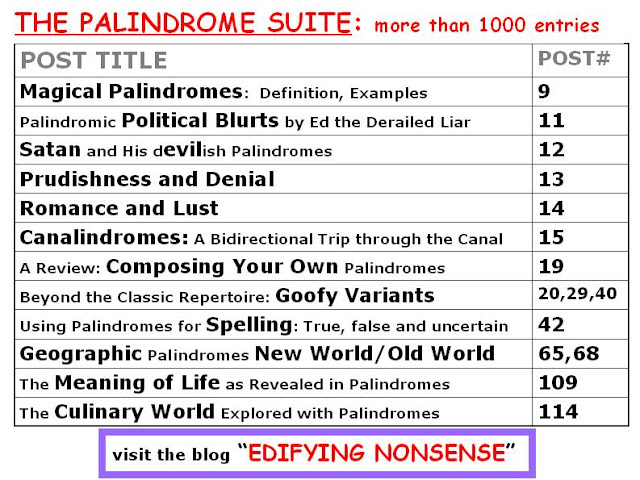 A list of 80 palindromic phrases and sentences. EDITOR: Giorgio Coniglio, December, 2016. Contributions are a mix of phrases drawn from standard lists and those concocted by the author. 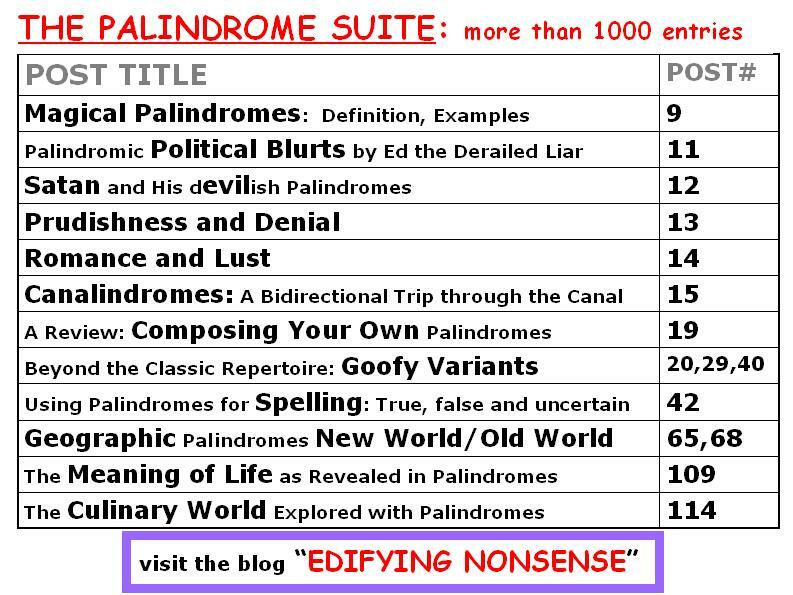 Please see our sister blog "Giorgio's Ukable Parodies" for the related song, "The Palindromes of Evil". A Maj., a plat, a fatal pajama. Amor, a dab. A bad aroma. Ate plate, elk cub, ergo ogre, buckle et al. - PETA. Bats enliven evil nest, Ab. Dennis, Enid and Nadine sinned. Dennis, Nell, Edna and Ellen sinned. Dennis, Nell, Edna, Ada and Ellen sinned. (for Ada you can substitute any other palindromic name, e.g. Anna, Ava, Aviva, Elle, Eve, Hannah, Lil, mad Adam, Otto; also Dad, Mom, Sis, Pop, I). Dennis, Nell, Edna, Ari, Ira and Ellen sinned. (for Ari, Ira you can substitute Allen, Nella; Rima, Amir; Leon, Noel; Nat, Stan; Gert, Reg; Eva, Dave; Nora, Aaron etc). Dennis's inn: Edna and Ennis sinned. Dennis's inn: Edna, Eve and Ennis sinned. etc. Dog, as a devil deified lived as a god. Evil - A sin is alive. Evil. All its sin is still alive. Evil axis - six alive. Evil did I dwell. Lewd did I live. Gnostic illicit song; agnostic illicit song. Knife idea, Mae. Die, fink. Male rut rote: torture, Lam. No 'D'. No 'L'. Dwell lewd, London. No! Evil's deeds live on. Rawer burger murders: re drum, re grub, re war. Red rum, eh? 'Twas I saw the murder. Reviled I did live; evil did I deliver. Rot-parade: villained denial lived. A raptor. Tennis? No sir! prefer prison sin-net. War-ware. Nip art. Rapine - raw, raw.